FLUIDITY AND LUMINOSITY: THE GREENLAND DISPLAY SUITE. 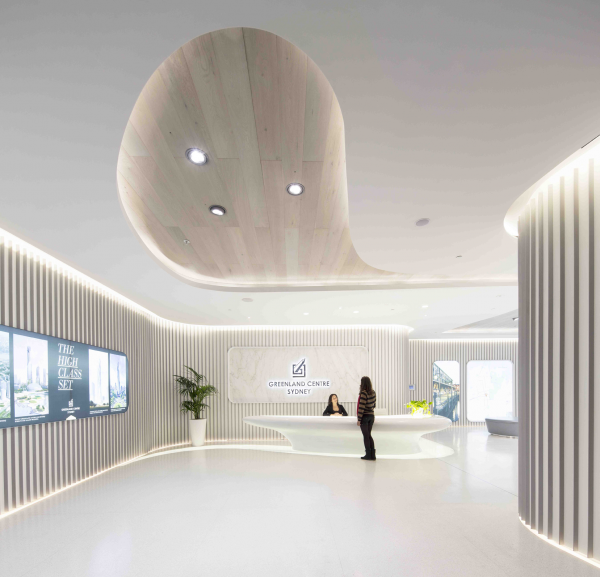 The display suite for a new mixed-use tower by PTW and LAVA merges natural materials with high tech fabrication technologies. 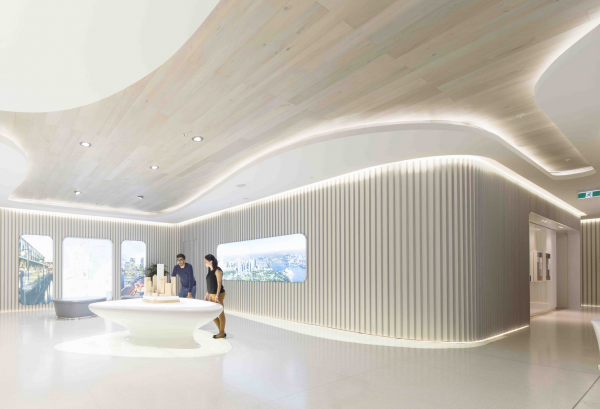 The organic-shaped marketing suite, with cool white surfaces and freeform furniture, showcases the new Sydney Greenland Centre, and is Nature and Technology in harmony. People in the 21st century are looking for spaces that link them to nature, and the organically-shaped forms found in nature - waves, canyons, clouds – were the inspiration to create a beautiful, efficient and connective space. 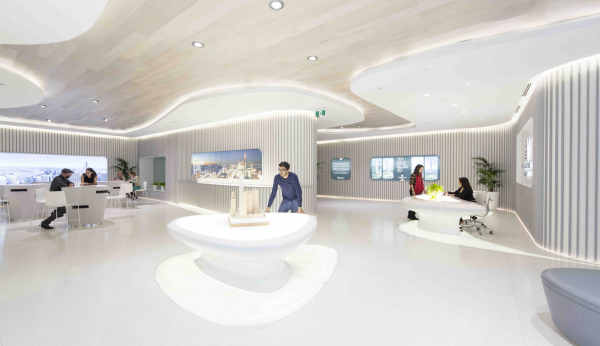 The brief was to transform the lobby of the 1960s Sydney Water Board building into a marketing space to promote the Sydney Greenland Centre, a new mixed-use tower; and to take the visitor through a journey of the new building. 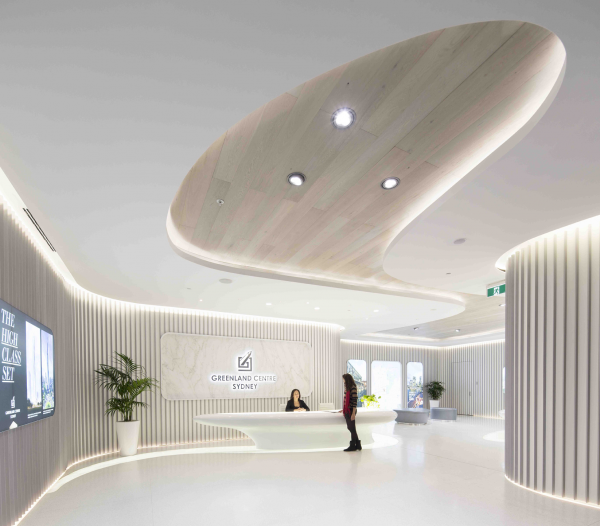 The objectives were to create an immediate sensory experience from the urban streetscape that would entice prospective buyers and dramatically announce Greenland Group’s presence in Sydney, establishing a new benchmark of strong, design-based development. 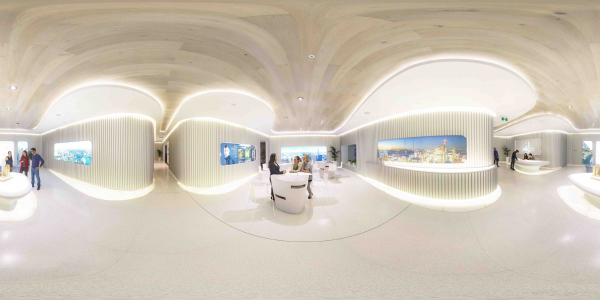 The display suite was designed as a light, dramatic and sinuous series of spaces with glowing floors, free-form furniture and coloured lighting effects, offering visitors a transition from the everyday to the sublime. The Greenland Centre will house apartments, retail and commercial. It incorporates two Water Board buildings: the adaptive reuse of the eight-storey heritage-listed 1930s Pitt Street building and a new tower on top of the 1965 Bathurst Street building. 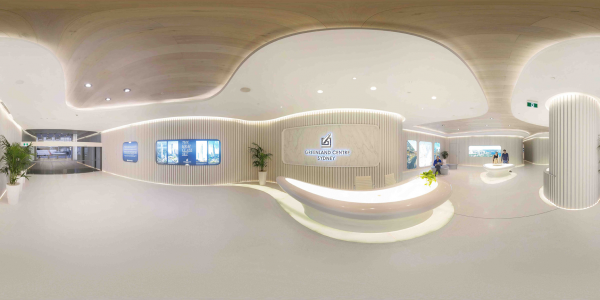 The organic fluid space connecting man to nature is the new generation of sales suite, and has assisted in excellent pre sales of the apartments by CBRE. The centre playfully expresses fluidity and light in the reception area that flows effortlessly into a larger meeting room. These two spaces display apartment lifestyle and imagery, a model of the development and informal contract-signing places. The unique spatial perception and dialogue is established with all surfaces [wall, floor and ceiling], and furniture integrated into the space rather than being separate elements. 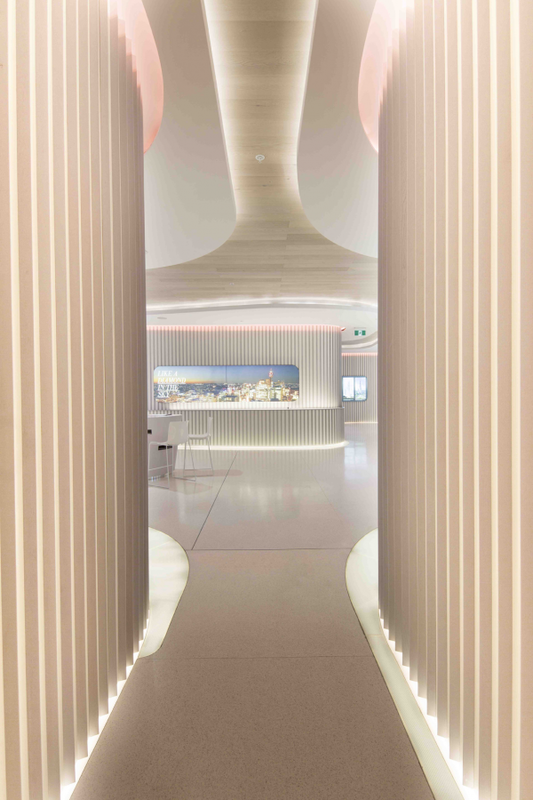 Pale coloured timber is used on the ceiling and the walls, with dynamic white surface undulation and seamless integration of light as material. 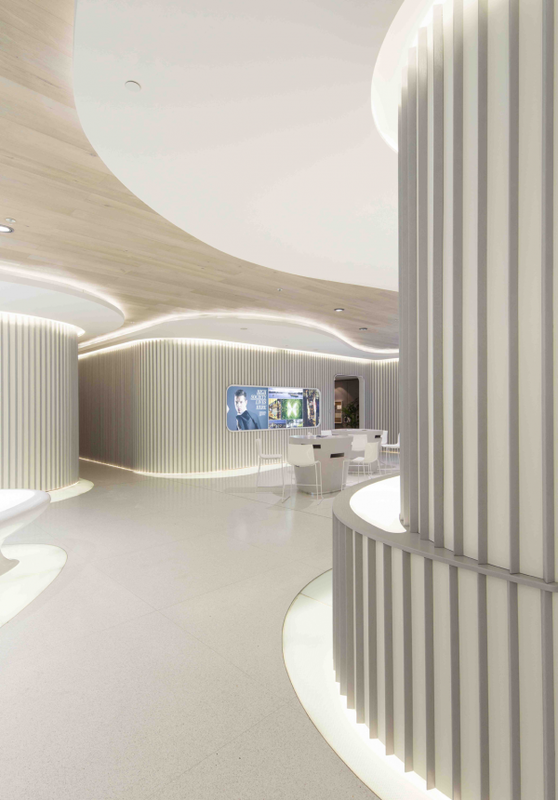 The materiality is cool but comforting - ice white leather alternates with white ash strips on the walls, white oak composite on the ceilings mirrors the floors. The sales furniture features white oak-veneered freestanding joinery with metallic silver leather upholstery and white satin fibreglass tables with an LED backlit glass top. Continuous lighting strips unify the experience. The main challenge was that the total time for design and construction was less than 10 weeks and 2 weeks before opening a fire in a nearby substation put the project on hold and smoke damaged items had to be replaced at short notice. Innovative, integrated design and construction methods facilitated the ten-week program from concept to completion. Prefabrication processes generating time and budget efficiencies included 3D modelling for speed and accuracy of off-site manufacture, and rapid prototyping and the latest glass-reinforced gypsum technologies for free-form furniture elements were used. The beauty of GRP is that organic shapes are created out of one piece of material, both structure and decoration are one. 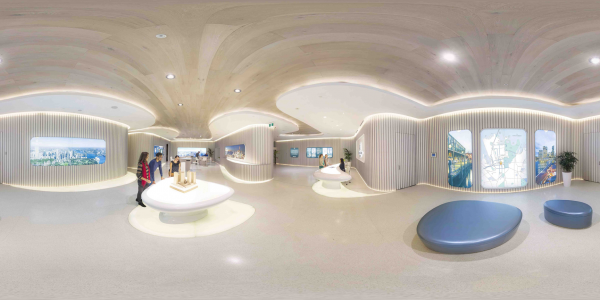 Other sustainable features include low energy light, in-situ poured terrazzo, and locally manufactured items that were all sourced from within one hour from Sydney. Natural renewable material, such as timber, is used on the ceiling and the walls.